Q. What sprinkler heads are best? A. Different sprinklers are applicable to various conditions. i.e. Large turf areas, small turf areas, ground cover, shrubs, etc. Q. What manufacturer’s sprinklers are best? A. Generally, all major manufacturer’s equipment is good. WE usually use Rain Bird® because their repair parts are easily accessible, and their equipment is outstanding in quality. Q. Is any special plumbing needed? A. Yes. Some internal plumbing is required. It is done to code, using the proper back flow prevention equipment, high quality copper tubing, and the highest quality fittings and valves. Q. Are any permits or licenses required? A. Yes. You must make sure the contractor installing your system is going to get a permit from your municipality for your irrigation system. 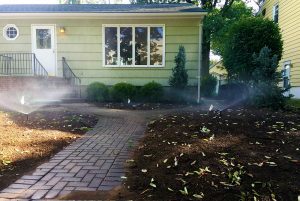 It is best to make sure the company installing your lawn sprinkler system is licensed by the state for landscape irrigation and also has a license as a home improvement contractor. Q. Do you also service the sprinkler system you install? A. Yes. It’s usually best to have the company who installs your system, also service it as they know the system the best. We do both installations AND servicing. Q. Can you provide me with references? A. Absolutely! It’s important that the company you select has been in business for a while and can provide you with references, preferably with homeowners or businesses near your location. Q. What is back flow prevention equipment? A. They are devices required by law, which prevents the back flow or suction of water from the irrigation system, back into the drinking water supply line. This could occur under some very unusual circumstances. Q. Is a metallic sprinkler or fittings better than plastic in an underground installation? A. A sprinkler head constructed of cycolac (plastic), is by far, better than any metallic head. It has no corrosive reaction to water or soil. Connections done with schedule 80 PVC are stronger and more durable than brass, copper or galvanized steel. It is specified for the heaviest commercial use. Q. Will my lawn be disturbed? A. We use a trench-less pipe installation method, which sews the piping in the ground, using a thin blade. Depending on quality of turf conditions, you will see either nothing upon completion, or see a thin seam which seals within 7 to 10 days. Q. What is better, PVC or polyethylene piping, for sprinkler systems? A. In general, where the length of piping from source to farthest sprinkler is under 1500′, polyethylene is preferred. It is easier to install, usually needing no trenching and easier to alter or repair. PVC however, has less friction loss and will give a slightly better pressure after a long run. The vast majority of residential and commercial systems have “Runs” under 1500′, so polyethylene is preferred. Q. Does the system require any regular maintenance? A. Yes. It is recommended that before the onset of winter, your system be winterized. This is also referred to as “blown out.” The alternative is to build a system with automatic drains. This is not recommended for two main reasons. First, the entire pipe network empties after each use, and must be refilled before it will operate again. This constant emptying of the pipe network causes great water loss and expense. Secondly, there is no way to monitor these automatic valves. One could easily malfunction, allowing water to remain in the piping. Q. How long does it take to install the system? Q. Once we decide we want a system installed, what should be done? A. Call us. Tell us the best day for you. Once the installation is started, the system is usually operational within 8 hours. Q. Can the system be automatic? A. Absolutely, completely automatic. We specify and use reliable controls which are easy to use. All systems are equipped with rain sensors.